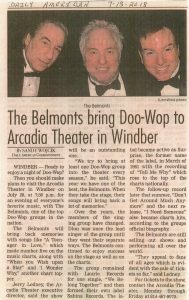 Check out the latest article in the Somerset Daily American about our next show – “The Belmonts”, scheduled for July 28, 2018 at 7:30 pm. Ticket Prices – $28, $32, $36. Call the Box Office at 814-467-9070, between 10 am and 4 pm daily. Or order your tickets by clicking on the BUY TICKETS tab of this website. Some Video of Blackbeard the Pirate from July 14th Tribune-Democrat Highlights The Belmonts Show!